For many decades prior to his passing, Ernie Camuso of Burnet Hill Road in Livingston designed and built one of the most elaborate Christmas Displays New Jersey has ever seen. A toymaker, and later machinist, by trade, Mr. Camuso collected numerous animated robotic figures. Many were designed to be doing specific tasks related to toy building and loading Santa’s Sleigh full of gifts. The animated characters, coupled with tens of thousands of colorful lights arranged in a display open to the public on his front lawn attracted thousands and thousands of people each year around the holidays, eventually requiring police traffic control on Burnet Hill Road. People in and around Livingston grew up viewing the display each year and many have very fond memories of it. Dating as far back as the 1960’s, the display has touched generations. The centerpiece attraction is the Christmas tree built by Mr. Camuso. 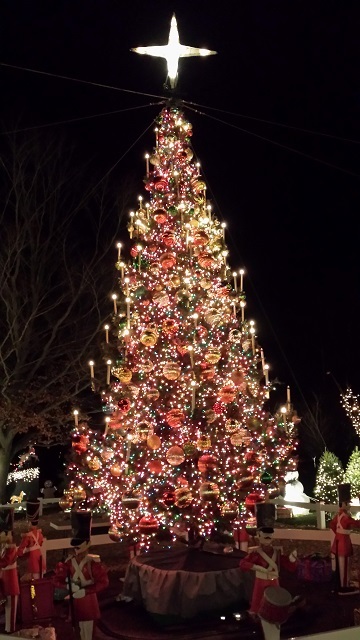 It stands 26 feet high, rotates on a mechanical base, and has more than 10,000 colored lights adorning more than 100 individual tree branches, capped with a 4 foot lighted star. Over nearly four decades, Camuso amassed more than 100 animated figures and numerous mechanical display pieces. Following his death several years ago, the Camuso family could no longer set the display up each year. They turned to the Township of Livingston and the entire collection was donated to a volunteer group known as the Camuso Committee. Many of the figures and display attractions were determined to be very old, broken, brittle, and in serious need of careful repair and restoration. Since 2011, members of the committee have worked tirelessly to begin the process of restoring the entire collection to its’ original condition. This has included painstaking restoration work that is time consuming and at times costly in terms of materials needed. Although many have been repaired, many more are still in need of restoration. The resurrection of the Camuso display has drawn thousands and thousands of people to the exhibit the last four years. Endless stories are told by visitors of how they travelled each year while growing up to the Burnet Hill residence and how they remembered particular characters and scenes. Many travelled from very far away for the opportunity to once again see a part of their childhood and share it with their children and grandchildren. The display is an iconic part Livingston history and the work of the volunteers in bringing it back has been well received and recognized by the public.